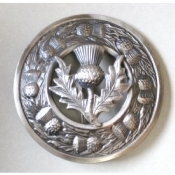 This attractive antique style Plaid brooch features the Scottish Thistle center and Thistle motif border, 3.5 inches wide with antique finish. Made in Scotland, UK. Please allow 2 to 4 weeks for delivery?